Home to independent businesses, coffee drinkers, thinkers, skateboarders, jazz clubs, artists, time travellers, live music and performances, award winning architecture, a radio station, record shops, dreamers, fashion designers, music studios and international delicacies, Gillett Square is a community. Open Source, in partnership with Dalston Studios and the Vortex Jazz Club, is license holder and events producer on Gillett Square. Dalston is developing fast in every direction and it is vital that it’s cultural value is maintained and developed as we collectively build our future, in its venues and public spaces. This platform recognises the importance of public space and its invaluable role in community life. 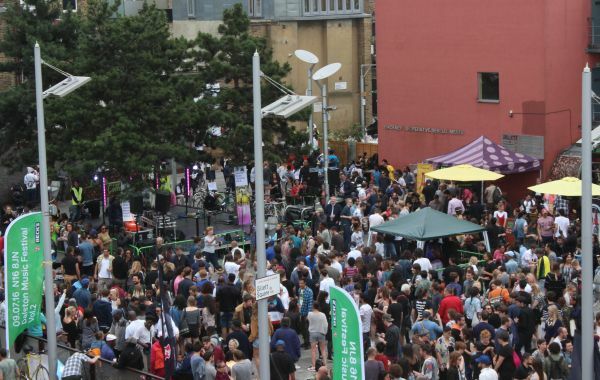 The programme aims to sustain and develop local wealth beyond purely economic terms, presenting cultural events which include live music and arts, games, sporting and educational activities for all, ensuring that Gillett Square sustains and develops with the community that makes it one of London’s most remarkable public spaces.